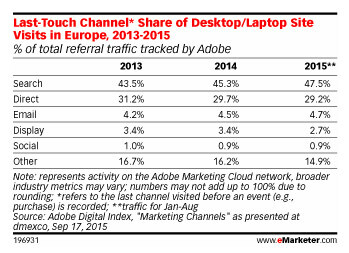 Search is King When It Comes To Last-Touch Channel Share | ASTRALCOM - Content Strategy, Conversion Marketing and Customer Acquisition. Regarding mobile search and traffic, the study points out that, “From 2013 to 2015 search ad share has grown in North America from 24.4% to 42.9%, an increase of almost 20 percentage points. That growth comes almost entirely at the expense of direct traffic, which decreased from 51.2% in 2013 to 30.9% in 2015. Read the eMarketer article and get the whole story. Then, call us at 800.536.6637, or click and let’s talk about how our Search Engine Dominator program can help you connect with more consumers.